This is a RC flight simulator, not a game. You might find that the controls are hard, but that's because it's made to mimic flying a real life racing quadcopter. Supports physical controllers. It is HIGHLY RECOMMENDED to use a good physical controller, it makes flying so much easier and more enjoyable compared to using touchscreen controls. 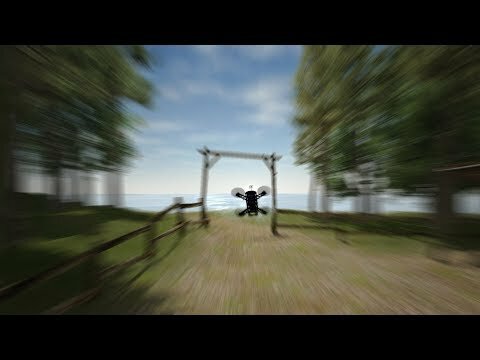 Fly (and crash!) all you want regardless of rain, wind, sleet or snow. Supports first person view (FPV) and line of sight (LOS) flying. Includes self-leveling and acro mode. Note: The quad in this demo has deliberately sluggish settings, this demo is just so you can try if it works on your setup, in the full version you can tune the settings precisely to your liking. This demo includes one scene (the desert). The full version of FPV Freerider includes six sceneries as well as a racetrack generator that can generate millions of tracks by procedural generation. The full version also has setup options for rates, camera and physics, as well as 3D flight mode for inverted flying. The full version also supports Google Cardboard type VR goggles. Touchscreen controls support mode 1, 2, 3 and 4. If the simulator doesn't work on your device, it doesn't work, simple as that. Most probably nothing to be done about it. Giving a low rating does not help. If your device supports USB OTG and you have the right cable you can try to use a USB gamepad/controller for better control. Physical controllers are configurable between mode 1,2,3 and 4. There is no guarantee that it will work with your device/controller, please try this free demo first to see. Controllers that have been used successfully include FrSky Taranis, Spektrum, Devo, Turnigy and Eachine radios, Xbox, Playstation, Moga and Logitech gamepads, Realflight and Esky USB controllers. Please try this free demo version to see if it will work with your particular setup.